I went to T'aif on Tuesday to try and get my driving licence. My travel to T'aif was accomplished by taking a lift in a truck driven by a Kannadiga. He was about 50, very affable, and has been in this country for over 6 years. His family lives in Riyadh, and his driving takes him almost three to five times a week from Riyadh to Jeddah and back. I took care to check that I hadn't dropped anything in his truck when I got off on the bridge where he took a right turn to proceed to Jeddah, while I had to go to the Traffic Dept , T'aif police, to subject myself for the licensing exam. A Saudi taxi ferried me to "Dallah", the relevant place that is about 25 km away from the city's center. He even accompanied me inside the enclosure, and helped me submit my documents etc. to the correct counter. He was, however, very business-like about this and extracted extra fare from me for his unsolicited services. Armed with a properly constructed file, I went inside and across the square to the test area, where I met a Sudanese driving instructor who made me sit in a car (with him sitting next to me) and asked me to drive the car in reverse. He did not me allow any time to get comfortable with the car, and summarily asked me to get off when I was unable to do his bidding in a smooth way. He told me I had failed the initial evaluation, period. Dejected, I decided to meet the police major in charge; he allowed me to pay the cash for a test, whereupon, I went to the cashier and tendered SR 100 for the test. I was told to then go home and return at 4.00 p.m. for a signals/indicators class and a driving demonstration. I returned to T'aif and took up a room in Hotel Noof near Gazzaz - the usual place for me. The care-taker gave me a discount of SR 10, and offered a small room for SR 140. I settled in for the day, with one handicap. I had not prepared to stay overnight, and hadn't brought my laptop charger, or change of clothes or toiletry. I went down to eat my breakfast at the Thara Restaurant, made calls to home and told them the news, and then went back to the room to relax and watch cable T.V. Zee Aflam was showing "Badshah" (the SRK movie). Later, I went down to T'aif's Heart Mall/Panda, and went around the mall, browsing through the shops that were open. I had a lunch of Chicken Pasta at Pasta Bella, one of the shops in the Food Court (SR 20, including a free Pepsi and a free salad). It was very filling. Adding cheese to it would have cost an additional SR 2/= and I skipped it. After this, I went back down to catch a cab to go back to Dallah. The class assembled at about half past four. The teacher was an Egyptian man who kept talking in Arabic, to the utter incomprehension of me and a few other Indian students. He showed us all the signals and road signs, walked us through the format of the computer test on road signs, and also spoke a lot on what was expected of new drivers when they went on the road in their cars. I told him to explain what he had already said in English, but he did not oblige. After an hour long session, he took us all to the test driving area (which he referred to as the "maidan"), and there, he showed us what was expected of us when we appeared for the driving test at half past seven the next morning. We were to take one round of the circle, and demonstrate reverse parking and so on. I made friends with a young Saudi called Abdul Majid. He offered to take me back to my hotel when we finished our class at 6.30 p.m. I saw him drive a SUV with such grace and ease that I was surprised when he told me he had no licence as yet and was simply winging it in his father's car. He spoke a fair amount of English, something that helped make the acquaintance without much difficulty. I requested him to pick me up the next morning as well, and he agreed to co-ordinate it with me the coming morning. I then went up to my room, saw a little more of TV, etc. I went down to the nearby Asian Restaurant for dinner (chi. masala and roti). By and by, I returned to my room and went to sleep at a little after 11.00 p.m. I left the room at 6.20 and walked down Shubra street to arrive at the mall a little after 7.00 a.m. Abdul Majid came at about 7.15. 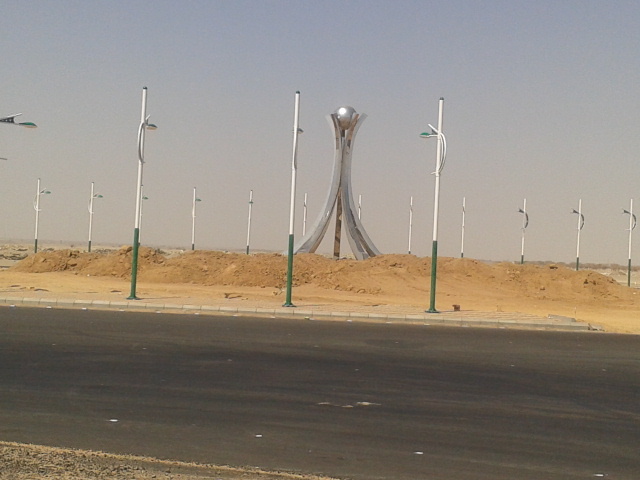 He picked me up opposite the mall and just outside the local branch of Al Rajhi Bank. We reached Dallah at a half past seven. We gathered outside the test driving area, but it was only at 8.20 or so that we were called in and handed our test cards one by one. We were then led to a waiting room where we would be occupying chairs and await our turn to be taken to a car for the exam. In a nutshell, I bombed my test. Although I accomplished the circle of the area with just a few minor hiccups, I could not reverse into the designated area. In fact, the vertical post that marked the rear limit of the area toppled when I drove back into it. The policeman who was evaluating me gently asked me to leave the car and showed me what I had done. I smiled sheepishly then. He marked me a zero, and asked me to return on Saturday when the school re-opened after the weekend. Abdul Majid did very well, and emerged with a new licence within 45 minutes of his test. He empathised with me, and took me back to my hotel where we parted. I was in no mood for hanging around, which I could have done as my room was booked till the afternoon, so I checked out before noon, took a dabbab to the SAPTCO bus stand, and was in a bus that left at noon. I returned to Al Muwayh at a little after 2.40 p.m., and walked all the way to the Hospital where I met Dr. Yasser and the others. I told them about my performance, and also thanked Yasser and Dr. Shehab for covering me in my absence for a second day. After that, I went back to my room. Nothing eventful happened after that. I went to the local Pakistani restaurant for dinner. I returned to my room to do a bit of internet surfing, saw an episode of "Lie To Me" (Season 1, episode 1) and did some other stuff before going to bed at mid-night. This was the day I elected to go to T'aif to transfer some money home as well as to prepare a banker's draft for submission with my application form for MRCPCH examinations that I am planning to sit for in October this year. I took a lift from a Pakistani trucker called Umer. He was gracious enough to accommodate me inside the front cabin of his huge trailer. He has been working in the Kingdom of Saudi Arabia for more than 15 years now, and he turned out to be an interesting person with a lot of stories to tell. Being a cautious driver, he took over 2.5 hours to reach the point where I was to alight, as he was going further to Jeddah. I reached that point at about half past ten; we parted, and I walked a little distance before I could find a cabbie to take me to the bank's transfer office (the Tahweel Ar Rajhi) on Shubra street. This office, where I have so far gone over 10 times in the last seven or eight months, is located about 100 meters before the main taxi stand and the Gazzaz mall of T'aif. There was a considerable rush today, and as I stood patiently for my turn, I suddenly discovered that I no longer had my mobile phone with me. In a panic, I borrowed a mobile from a fellow person and tried to ring my own number. The number rang, yes, but there was no reply from the other side. There were just two possibilities: either the phone was inside my own room in Al Muweh, or I had accidentally dropped it in the truck in which I had come ...and the trucker had either not heard the phone ringing or something equally weird had transpired, of which I had no inkling. I completed my bank work, procured my draft and came out dejected. I tried my own number again, and suddenly, my phone was picked up by none other than Umer himself. He told me he had my phone, which he had found inside his truck cabin, and he told me I was welcome to come to Jeddah, where he had already reached, and try to retrieve my phone. I got into a cab to reach Jeddah, and reached there by 3.30 p.m. I called up Umer (by now I had his number as well), and we finally met inside the King Abdul Aziz university. He invited me to join him for tea, but I politely refused as I was already going to be late for my return to Al Muweh. I returned to the bus stand in the same cab, and eventually boarded a bus that would arrive at Al Muweh by half past ten in the night. In the event, I actually reached at about 12.45 a.m. The bus got delayed because of two reasons: a) its air conditioners failed and we had to pause for about half an hour before they could be turned on again, and b) the driver and his assistant were both meek, slow driving Bangla-deshis, who covered a journey of about 400 km in seven, instead of five, hours. I requested the driver to drop me off before the bridge that heralds the arrival of Al Muweh, and from there, I walked it up and got to my room inside the hospital at a little after quarter past one a,m. Thus ended a day of troubles that had started off so well and with wonderfully small targets. I am writing this at about 1:00 a.m. in the morning on Friday. One day of the weekend has passed, and the other is on. It has been a lazy working week, and Thursday was no different. The only discomfort I had to accept and accommodate for was that I had to go out a long way to have my brunch. Readers may not all be aware that currently, I am staying in a room inside the hospital, and not with Dr. Shahid at my old place as Dr. Shahid's family has come from India and they need the privacy. My hospital room is a simple affair with a clean decor, about 250 sq. ft. of carpet space, a large, clean wash-room with an efficient shower, a single bed and a few chairs and so on. Certain essentials are missing, for example, a refrigerator and a geyser inside the bathroom. Also, there is no stove and no kitchen. Hence, I have to bring my food for the next morning and afternoon in advance on the previous night, at least on the working days. On the weekend, however, I decided to go to the restaurants AT meal-times and have fresh food. Accordingly, I went to the local Kerala restaurant for a brunch of dosas with traditional sambar and a masoor-dal. I went to the same place for dinner as well, and had a fish curry with chapatis. The fish pieces were good, but a little too big for my appetite, and I had to leave behind a large chunk on the plate. In between, I did a little bit of this and a little bit of that. I saw a few episodes from the famous serial Modern Family, slept for an hour and a half in the evening, and downloaded some books from the net. I also chatted with both my daughters, spoke to mom and also Nishrin. I spent some time chatting with the resident doctors in the ER, in particular, Dr. Measser and Dr. Ehab. The former is a Syrian general surgeon, while the latter is a Physician from Sudan. Today, I walked over 5.5 km, to the garden and back. As this was after a relatively long time, I am nursing my legs right now as they are hurting. I intend to continue vigorous walking in the days to come as well. That's about it for now. Cheers! One would have thought that writing one’s own diary would be a personal thing; this is, in fact, how one maintained one’s diary before the advent of the computer, and later, the internet. One usually went to a good shop at Abdul Rehman street near Crawford Market in south Mumbai and browsed at the collections displayed at the several book shops lined up on that venerable road. Perchance, one saw a nice ornamented diary for the coming year (one generally went to shop in December), and if the price was right (the balance was between what one could afford vs. what looked elegant and beautiful), one purchased that book and took it home, thinking ahead of how one would embellish one’s daily record with some flowery margins or pasting pictures, or covering the diary in a nice shimmering paper. After reaching home, one perused the diary’s front pages of information. A good diary would have, for example, a personal memoranda page, STD codes for all the possible, available places in India, ISD codes for international dialing, PIN codes of all the postal stations in Mumbai, an important telephone numbers (hospitals, police, fire, ambulance, etc.) page, currencies of the world, conversion tables (metric, apothecary, British, etc. for weights, liquid quantities, measures, etc. ), political maps of the world, India, and Maharashtra, a road map of Bombay (Mumbai), Delhi, Calcutta (Kolkata) and Madras (Chennai), standard Postal telegraphic greetings (1. Happy Birthday. 2. Best wishes on your promotion … etc. ), a list of Bank Holidays, and more. At the back, the diary would have a telephone diary of about 6-8, sometimes more pages, and this value addition made the purchase even more sensible. Going through these almanac-like pages was one of the pleasures of buying these diaries, although, to be honest, one hardly ever referred to these pages after this first day’s study! Come 31st December, and one would take out a fresh ball-point pen and start the diary by writing in some sort of a Godly symbol like 786 or Bismillah on the first page. One then filled up the “Personal Memoranda” page with one’s name, address, blood group, etc. One then reverently put the book on top of the other books and prayed that one would have plenty to write about in the diary from the next day onward. One then brought out the current year’s dairy and wrote something or the other for the last day of the year to satisfy one’s desire to end the diary in a blaze of interesting writing. The next morning, this diary would be relegated to the bottom of the books shelf/drawer and would become a thing of the past, to be looked at occasionally to recall some momentous event that had occurred during the year. Or, more likely, it would remain there, unattended, collecting the grime of time and the motes of dust that cover everything over a period of years and decades. Many personal diaries were retrieved after the death of a person, and several were published in the form of books, e.g. "The Diary of Anne Frank”, while others were converted by talented groups of artists and people into plays and movies. In the meantime, something happened that changed the world of diary writing forever. It was the birth of the Digital Age. With the arrival of the computer, die-hard diarists continued to get their kick from buying ever more ostentatious diaries and kept writing in them – as if defying the march of Time and the arrival of modernity. However, many others gave in to the pleasure of typing out their daily activities on the desktop computer and saved the page as a leaf from a soft-version of a diary, using MS Word. Over the years, diary writing infiltrated into the realm of Internet v. 2.0, and web-logging was born. Web-log became “blog” and the site “Blogspot” developed an internet based interface for people to write their diaries in. More such sites opened up such as “Word Press”, and pretty soon, blogging became a rage. People could now put up their blogs like a show-case to the world, and self-flattery and good writing became the new substitutes for honest, perhaps grammatically less correct, but emotive old-fashioned writing of one’s thoughts. From that stage to public blogging was a faster conversion, and soon, blogs became a mode of trans-gender, trans-national, trans-religion, trans-everything form of sharing one’s news, views, and daily activities. A sort of public voyeurism was born, and people allowed their family, then friends, then acquaintances, and finally the whole wide world to peek into their personal lives – at least over the net – virtually. As eyeballs (the net equivalent of foot-falls) increased, so did the scope of blogging; people decided that if they were writing good stuff, they had a right to earn off it. And thus was born advertising on the blog. Companies like Google, Kontera, etc. developed software to place advertisements strategically inside a blog with the consent of the blogger. Not just that, the revenue generated from such placements and their successful conversion into buys, was shared with the blogger. Internet v. 3.0 arrived with social networking sites like hi5, Myspace, Orkut, etc. and finally, the mother of them all, Facebook. Facebook-sharing became the norm for all blog writers, and thus increased the visibility of the diary before hundreds, thousands, millions of its users. And this is where we are at today. We write blogs, allow advertisements in it, and invite readers to read our daily experiences … or we create blogs with topics that will attract people through targeted Google search or other search engines, and hope that readers will also click on the advertisements and buy stuff, thus generating revenue for the writers. At the same time, blogging enables the modern techie to continue evolving – as a writer and as a person. Days lead to nights, and, with Allah's grace, nights unfold into new days, as my stay in Al Muwayh continues beyond my apprehensions for my father's ill-health and I settle to complete my first year in the Kingdom. News of the demise of one of the royals of the Kingdom came in on Saturday (it was the death of their Interior Minister and deputy Prime Minister and heir to the Crown, Prince Nayef) on the TV, and a three-day mourning was being foretold. Patients are few and far between, on account of the increasing heat outside, and the possible flight of Saudi Arabians to other, cooler countries/parts of KSA at this time of the year. (Vacations have begun already). I am currently doing "on-call" and I was supposed to go to T'aif today to give my driving licence test with Dr. Maesser, the Syrian resident doctor, but he backfooted yesterday night and we had to keep our plans on hold until a more opportune time, perhaps in the next week. My stay in the hospital's room on the upper floor continues till Dr. Shahid's family leaves with him, perhaps at the end of this week or slightly later. The room itself is clean, but there is the problem of my having to go outside to eat my meals, as there is neither a kitchen nor a refrigerator in my room. I have a more relaxed day, as I have to simply climb down a flight of stairs to join work, climb up a flight of stairs to go for lunch, and so on. However, on the flip side, it is more trouble after the end of the working day as I have to go long distances to access the super-markets or reach the garden where I go for my daily walks. Also, I am unable to access my own belongings that still lie within my old room in which Dr. Shahid stays with his family. And, I have to drink water at room temperatures, and food that is cold (I buy my next day's lunch on the previous night and leave it in the room with the A/C turned on, hoping that it will not spoil till noon on the following day). Dr. Yasser, my pediatric colleague, bought a Mercedes used car during my month in India, and has, therefore, become more "mobile". As per the news, he is shifting to a better house that is farther away from the hospital than his present premises. It was nice of him to give me a lift one of the evenings even while his family was in the car with him. He slowed down near me and offered to take me to the hospital. In the coming months, almost 4-5 nurses from the hospital are leaving the Kingdom; of these, there are 3 Filipinos and 2 Indians. As it is, the hospital is suffering from a shortage, and their exit, unless substituted by arrival of new nurses, may cause more problems for the administration. I hope and pray that replacements are found soon. A new restaurant that opened on the main Al Muwayh road has helped me get food for the last few days. Owned by a Saudi, it has Yemeni cooks and menu, and an Indian (Muslim Maharashtrian from Mahad) cashier/manager (one Mr. Sayed Abbas). He - Mr. Abbas - is a cordial person, and enjoys talking. He even served me a tea free of cost on our first meeting. Since then, I have purchased several things to eat, including a scrambled egg preparation that was quite tasty, and an overcooked mixed vegetable preparation that was just about passable. Along with the food, he gives a khubz free; however, his khubz is quite large, and impossible to finish in one sitting. That's about it for now. Thank you for reading. Since coming back from India, I have not really settled down mentally, as my father's condition back in India continues to worry me. Just a few days before my return, we discovered that he is suffering from chronic renal failure (his kidneys aren't functioning well), and, to push the matter further, I also hospitalised him for a night in Noor Hospital, and managed to carry out all the needed investigations. My brother informed me that his general condition had declined over the ensuing five or six days and his brother-in-law Dr. Saifeebhai had visited him and urged him to be re-hospitalised for possible urgent hemodialysis. Eventually, we did get him re-admitted a few days ago, and dialysis was begun on him on Friday evening. As I write this on Sunday morning, I am told that he has undergone two sessions of dialysis already, and his general health is improving, al-hamdulillah. I therefore spoke to our hospital's medical director Dr. Shehabeldin and urged him to seek permission from the Hospital Director Mr. Ahmed Farreh to allow me to stay in one of the rooms inside the hospital. On Friday, after the Jummah prayers, I contacted Dr. Shehab again, and after some consultations he had with the H.D., he allowed me to move in to one of the empty rooms on the first floor of the hospital complex. Yesterday, i.e. on Friday evening, I moved into room No. 6, thanks to the help provided by Dr. Aala Ashweh, the benign Egyptian ENT surgeon; he brought me with my bags etc. to the hospital and thus facilitated my smooth shift to the hospital. The various male workers then helped me take the luggage upstairs, and also cleaned the room well enough for me to shift in. Later in the evening, I visited the local market (bakalla) and purchased a few things that I thought I would need in my new location, such as tea packets, some biscuits, and so on. I had already carried my tea-maker with me from the OPD to home so as to enable me to boil water in my room. This, then, I used to make myself a cup of tea, and then spent the next few hours sorting my stuff and placing it in the most convenient place within the room. Today, the day passed awfully slowly, as there were hardly any patients in the OPD. I was on call as well; even so, there was no work, not even from the ER during the evening or the night. In the event, boredom creeped into me over the day, and by the evening, I was crying out from inside and begging Allah to make my life a bit easier and more interesting. I went for a half-hearted walk, and even visited a few super markets to while away the time, but all in all, I was feeling stifled in this very uncharming place. I took a longish nap in the evening, and also retired earlier than usual to bed, just so as not to stare in the face of immense boredom. Summer is here, and how! When I was in T'aif last week, I never realised how warm Al Muwayh had become as T'aif had been quite pleasant to live in. When I came back to Al Muwayh, I missed the realisation of the summer having arrived in full fury for the first few days as I did not go out on my customary walks. Our hospital is centrally air-conditioned, and, in my house, I usually keep the A/C on during most of the day and almost half of the night. The true temperature hit me on Wednesday, when I first ventured out in the evening for a walk. I could not manage more than a few km, thanks to the sapping effect of the extreme dry heat. My intake of water and juices had already gone up by a big amount, so I was not surprised when the temperature gauge inside a kind Saudi's car showed a reading of 42 degrees Celsius at 5 p.m. in the evening! When I remarked on this, the gentleman informed me that the temperature in T'aif had already gone past 42 degrees, and it was hovering around 48 degrees Celsius at Riyadh! Today afternoon, I decided to go to the garden to see in what shape the various things there were. I found that the grass that had grown so well on the lawns there had mostly turned yellow, and many bald patches had appeared where there had been a pleasant green. There was hardly any shade, although it was over five o'clock. There were no children or footballers. Both the black scrub-robins were gone, and there were only sparrows and a few juvenile white wagtails. No yellow ones, and no warblers either. Just a few swallows spun in the air, and they, too, were infrequent flyers over the garden. The hedges gave evidence of sparrowy chirps all through the evening, but the birds could not be seen. The gardeners had trimmed most of the hedges and there were no unwieldy patches now. The grass too had been trimmed down to a bare inch or two, and as it was almost yellow, the appearance it gave was of a landscape that one may perhaps see on the scorched plains of Tanzania rather than on the verdant greens of India. I almost expected to see a cheetah or hear the roar of a lion! In the later part of the evening, I was called to the hospital to see a patient. The walk from the garden to the hospital is over 2.5 km, and I punctuated it with visits to some of the shops down the main road. In particular, I was trying to ascertain the prices of several household items, because my room-mate, Dr. Shahid, is in the process of selling me his assets before he exits Saudi Arabia, and he has handed over a list of the items he wishes to dispose of, with their asking prices. It was a process of discovery, and I realised that in most cases, his prices were quite competitive. As I neared the hospital, I observed that the centre-pavement of the road was now adorned with new date trees planted afresh. This changed the view completely! 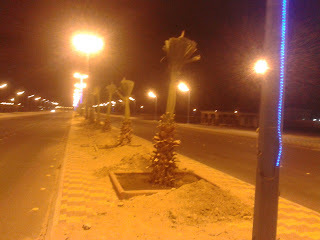 In fact, a few days earlier, I had taken a car ride with a Sudanese employee of the road improvement committee of the Municipality of Al Muwayh, and he had pretty much informed me that the trees would be planted soon, perhaps in a day or two. The date trees were, therefore, proof of the truth of his forecast. Further ahead, the area that had an artistic monument coming up had been spruced up further, the land abutting the road had been levelled, and the circular area around the pentadactyl monument was about 80% tiled and ready for display. The evidence of improvements to the civic amenities and roads was astonishing. I wondered if the rich municipality of Mumbai could achieve this much in such less time. Perhaps not, for their aim is not to enrich the city but themselves. And there lies the irony. It is because of the disenchantment one faces in a rich city like Mumbai that many avowed citizens of India go abroad to seek "greener" pastures. Getting on with my story, I spent the next day, Saturday as well as the following night and the next 1/2 day in T'aif. The reason was to visit the Muderiya (Health Directorate) to return my passport and pick up my Iqama and to conduct some financial transactions on Saturday, and to coordinate with the Al Muweh liaison officer Mr. Ali to receive back the amount of HRA deposited with the Cashier by him on the eve of my departure from KSA a month ago, on Sunday. What else did I do? Well, I visited the T'aif's Heart Mall to spend some hours there on Saturday, I ate heartily all my meals at the Asian restaurant located near my hotel, I had both days' breakfast at the Thara Restaurant next to my hotel, I made a few essential purchases at Panda Department stores, I explored both the Shubra and the Abu Baker streets, and I slept and relaxed for two nights. During these two days, I also assimilated a lot of information on how to navigate one's way through the mechanism that is part of the officialdom in the Health Directorate. One has to visit nearly 5-6 people/departments before the paper that is essential for one's return to the Kingdom is ready. One has to try and communicate in Arabic (such as my knowledge of it is) with several officials before you get their signatures on the paper you hand over to them. One has to do a lot of walking and climbing up and down their two storeys of offices (most confusing to do this as all offices look alike), while remaining aware all the time that there is no cafeteria nearby to sate your hunger or slake your thirst. One has to travel across the city to keep going back to their offices located on Garwa street ... almost 4-5 km away from the city's centre that is the Gazzaz Mall. To their credit,I must point out that once I had produced the receipt of the payment made by me via Mr. Ali, the officer in the Cashier department retrieved a brown envelope from a well-organised safe and handed over the cash to me within 2 minutes. The food I had in the Asian restaurant was wholesome, sometimes a little too oily, but always tasty. Hence I parcelled some of the items when I left T'aif to carry them back with me to Al Muwayh. What did I have? Well, I had a wheat porridge (Harees, they call it) on Friday evening, a kheema on Saturday morning, a dal on Saturday evening and a mutton curry on Sunday morning. By the third meal, all the waiters and the cashier/manager knew me well enough to attend to me more solicitously than before. I was offered an extra sweet dish, prompt service and a smile whenever I returned for the meal. It did seem like a shame that my fourth meal was to be my last meal for the time being. On Sunday evening, I bade good-bye to the hotel and T'aif and returned in a private taxi to Al Muwayh, just as I got calls from the Al Muwayh director to return by the evening as my colleague Dr. Yasser was getting ready to go to T'aif to be a part of a medical training course that would commence on the next day, i.e. Monday. 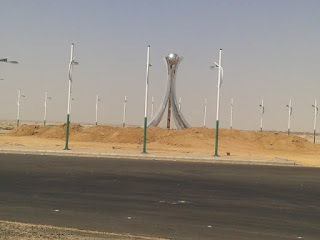 I arrived in Al Muwayh at about half past five, and immediately went on call for today as well as the rest of the week. Thankfully, though, I did not receive any emergency calls that night and was able to unpack and relax in peace. Today, I am taking the return flight to Saudi Arabia after completing my brief vacation. Will land in Jeddah by sunset, Inshallah. I intend to join work in a day or two. My holiday in India (specifically, Mumbai, and with the family, a 10-day vacation to Sikkim and Darjeeling) went off nicely, but for the worsening general health of both my parents. My dad will soon go on dialysis as he has been detected to have renal failure, and mom continues to be cardiac-handicapped and is restricted to the house. Will write more later ... am getting ready to go to the airport now.